This is a story about hope, kindness and redemption set in a grey dystopian world. 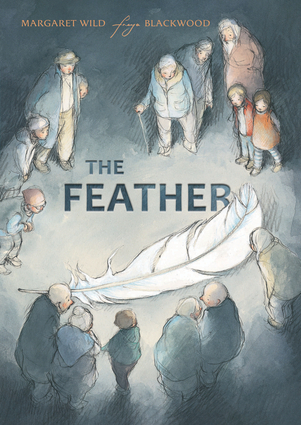 When a great feather drifts from the leaden sky, two children recognize its extraordinariness and take it to the village for its protection. The villagers, however, want to encase it, upon which the feather loses its radiance. The children take it home and care for it through the night. In the morning it is again radiant, and when they set it free it leaves behind the first signs of blue sky and color. The ambiguous ending invites multiple interpretations about the effects of selflessness and kindness. Margaret Wild and Freya Blackwood previously collaborated on The Treasure Box and Harry & Hopper.